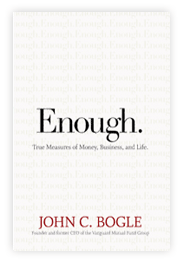 Enough: True Measures of Money, Business, and Life by John C. Bogle; Hoboken, NJ: Wiley & Sons, 2009. 266pp. John C. Bogle is founder and former CEO of Vanguard Mutual Fund Group. A 1951 graduate from Princeton University, he began his financial career at the Wellington Fund in Philadelphia. He founded the Vanguard Group in 1975. His most recent book, Enough: True Measures of Money, Business and Life, is an attempt to renew standards for 21st-century business by recapturing 18th-century values. Those recaptured values will provide different measures of success for business, money, and life. Ideally, it is a challenge to its readers to prize the values of industry, frugality, and stewardship. It seeks to restore the values of trust, professional conduct, and leadership to modern-day business endeavors, particularly in the financial sector. The book traces Bogle’s personal and professional history. It contains the competent knowledge of a mutual fund insider, who aptly describes the evolution of his craft over the past 57 years. Bogle navigates the complex financial industry while analyzing some of its current practices. According to Bogle, the current dysfunction of our financial system is emblematic of the systematic way in which financial managers have neglected their fiduciary responsibilities. The myriad of innovative financial products available, open the market to highly speculative deals and products. His ultimate claim is that the solitary pursuit of profit can end in selfish greed. When greed becomes the primary motivation, businesses extract value out of society instead of returning value to society, and the whole capitalist project is subverted. I highly recommend this book as a well-timed discussion of the importance of recognizing and respecting the boundaries of one’s financial, professional, and personal life. The ancient virtues of contentment and simplicity are being eroded in our fast-paced, consumer-oriented culture. As Michael Novak (1982) has suggested “The economic system cannot thrive apart from the moral culture that nourishes the virtues and values on which its existence depends.” Bogle’s conversation in this book seeks to develop such a moral culture where businesses return value to society. This goal, claims Bogle, is ultimately in the best interests of business and business practitioners. 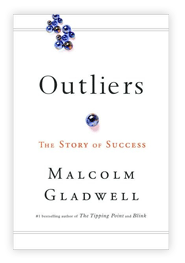 Outliers: The Story of Success by Malcolm Gladwell. New York: Little, Brown, and Company. 2008, 309 pp. that lead to success. Outliers follows the path he laid out in his previous works: presenting a thesis, illustrating with examples, and drawing conclusions. His work is less about a true scientific methodology, and more about a conversational observation of what seems to be. Outliers postulates that what leads to success is less about hard work, or rising beyond one’s circumstances to achieve something, and is more about inherent factors such as your birth date, your social environment, and the precise positioning of where you are born in the timeline of progress in a particular area. For example, hockey players in the Canadian leagues start out competitively at a very young age. But remarkably, it appears that those who are born within the first quarter of the year get the perfect start to their careers, balancing the optimal developmental age and the highest amount of practice time available. While talent certainly plays a role, this birth-month factor shows up so consistently as a factor in determining success, it seems that if you were not born during that point of the year you needn’t bother. In another example, Gladwell looks at why some of the richest people in the world had a similar factor critical to their success: the amount of time they were able to practice their craft. Gladwell identifies a 10,000-hour threshold, and shows examples of how people like Bill Gates had access to computer equipment and the time to use it. This one factor is enough to make the difference and influence success. It is an interesting thesis and Gladwell uses multiple examples to highlight this. Overall, Outliers has the same positive attributes as his other works — well written, easy to read, interesting, and thought provoking. However, it also suffers from some of the same criticisms. His conclusions are largely circumstantial, and are never documented enough to really hold up as a scientific study. Further, there doesn’t seem to be a use for the conclusions he draws. If success is so hinged on the factors here, then what can we do about it? Reviewed by Michael Erisman, Issaquah, Wash.